Another secret detail wedding dress peek!!! At dressmaker's now, originally uploaded by KT Flicker. We just had these flowers made. Last minute edition, although I had wished that I could have fabric flowers on my dress. When we needed to attach the tulle that cascades down the back and onto the train, we needed for it to be coming out of something. Hence, the fabric flowers. 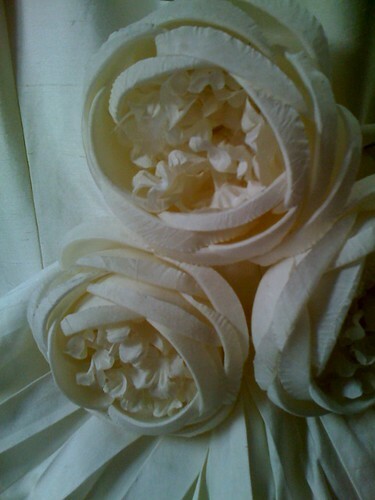 The direction to the fabric flower maker was peonies. Looks like he made peonies with hyacinth on the inside! We spent today re-positioning them on the dress. The first location had me sitting plum on top of them. But as for the dress overall, Jenny the dressmaker and I literally jumped up and down when I put it on and zipped it up!